Baylor (left) and Finley (right) each at two months of age! 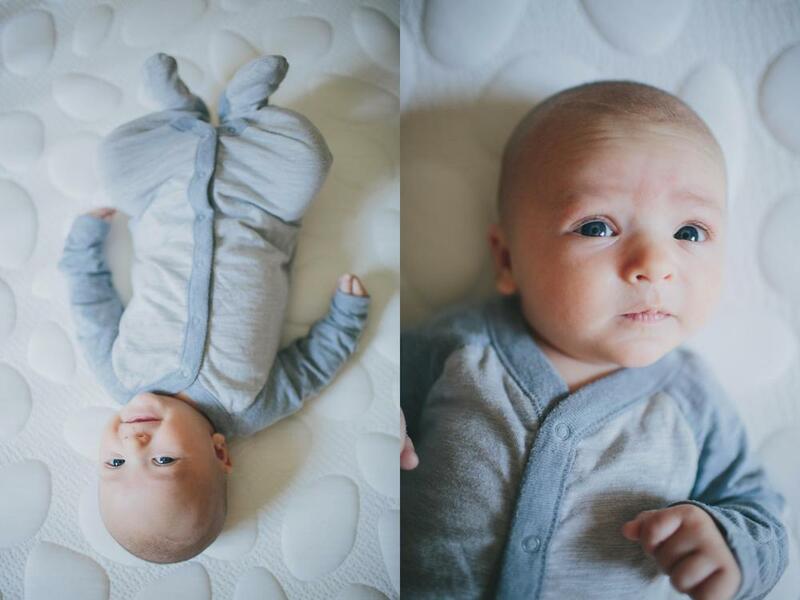 A squishy little newborn in a Lil Joey! Look at those kissable toes! I was hesitant to try this diaper, but decided to anyway! I'm glad I did, and I ended up loving it, but a lot of my initial hesitations were confirmed. 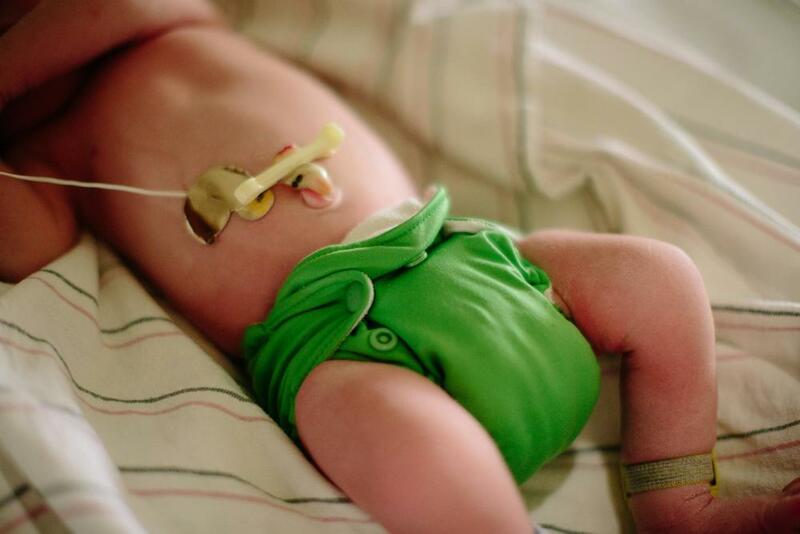 The photos of the green diaper were taken when my son was 8.5 lbs and 19.5 in. The photos in the blue diaper were taken at about 9 lbs 20 in. The photos in the yellow diaper were taken at about 9.5 lbs and 21 in. This was definitely the tiniest AIO newborn diaper we tried. 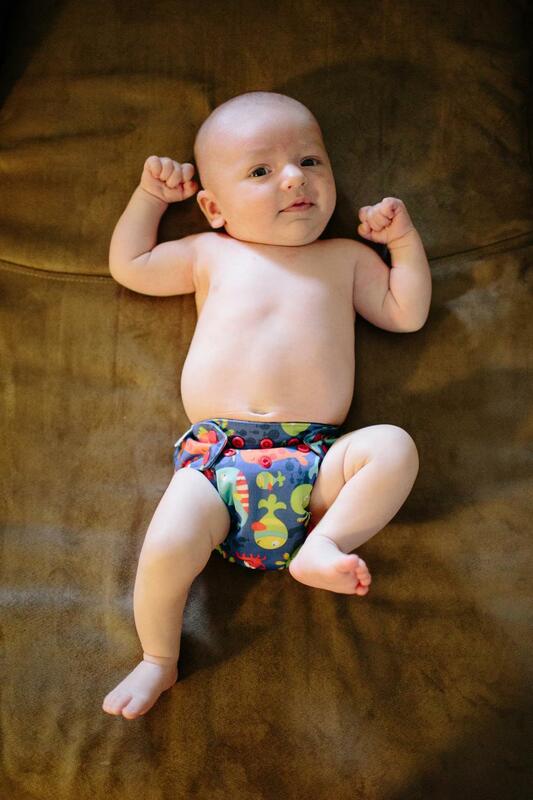 It was the first diaper we put on my son and it fit like a glove. So it truly fits a newborn, unless your newborn is really big... like 9+ lbs. The crotch width is thin and doesn't force a baby's legs apart. I love this. I hate when the crotch widths on newborn diapers are sized for toddlers! Adorable. Does that count as a pro? Very trim under clothes. This is a huge must for me. The umbilical cord stump snapdown is great. EXCELLENT RESALE! It's so easy to sell these even after you've used them on sites like Cloth Diaper Trader. I bought mine used but in excellent condition and got great deals to begin with, so I really didn't lose much to try these diapers out for a few weeks then sell them. I'll buy new ones for the next baby! The absorbency leaves a lot to be desired. These held up for about a week or so before they began to leak after my son went pee even once. Getting these diapers clean and dry is a challenge. 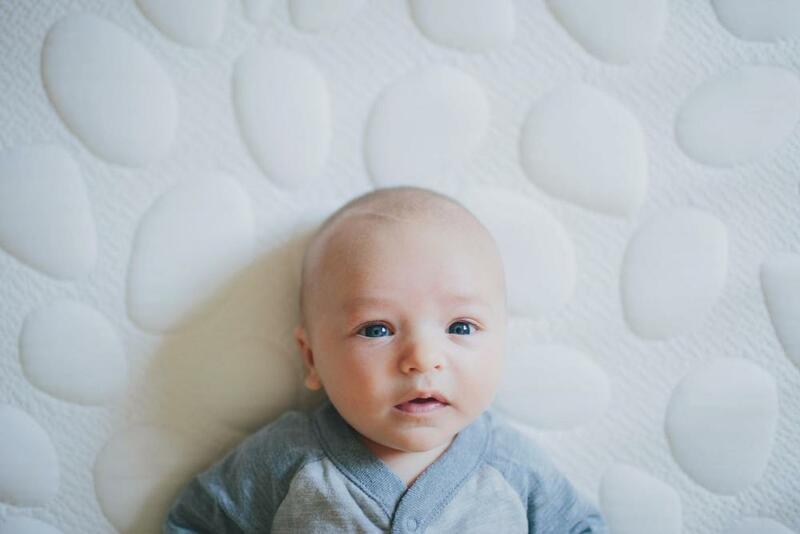 They don't lie flat, which makes them fit a baby super well but makes it hard for the creases to get clean. They're also thick because they're made up of lots of layers sewn on top of each other, so they probably don't get the best cleaning on the inner layers and take FOR-EV-ER to dry. I found that I HAD to put them in the dryer or they would get musty smelling, so air drying wasn't an option. I also found they took longer to dry than any other diaper in my stash. I would remove every other diaper from the dryer and then run these longer. Synthetic fabric. Maybe this is a pro for some but I find synthetics tend to get stinky and I definitely prefer a natural fiber against my baby's bum. The snap settings aren't very adjustable. They're spaced really far apart so you end up having to snap the diaper really lopsided or just dealing with it being slightly too tight or too loose when you're in between settings. Outgrown at a very low weight by size and absorbency. In my opinion, there is absolutely no way these diapers would fit until 12 lbs as advertised! I think less than 10 lbs more accurate for weight, and when the absorbency is outgrown would probably depend upon the child. I stopped using these on my son by 10 lbs and 3 weeks of age. They technically still fit at that point, but the rise was very short and they always leaked wetness and any kind of bigger poo. Would I buy this diaper again? Yes. But I would intend to use it pretty much only at the hospital and maybe briefly upon arriving home. That might seem like a waste of resources and money for some, in which case I would definitely not recommend this diaper! 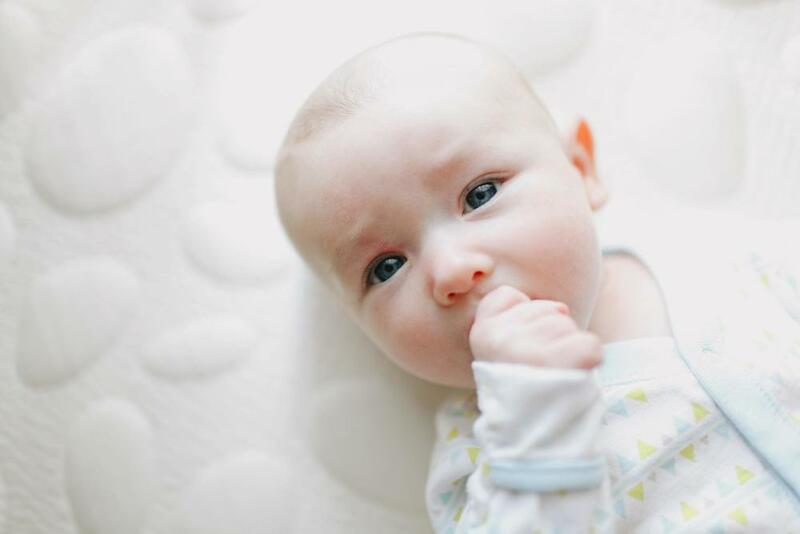 If you birth TINY little babies, you would probably get more wear out of these, but even then the absorbency might not be able to keep up with an older child, regardless of size. 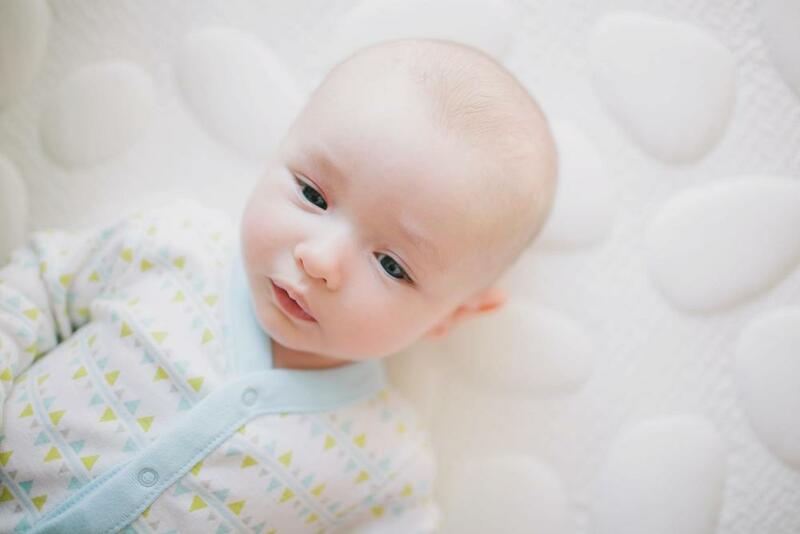 It was hard to obtain three of these Ragababe newborn diapers, and I'm glad I didn't try to get more because in my opinion they ended up being best suited for a smaller baby, which my son was not. The photo with the white background was taken when my son was about 9.5 lbs and 21 in. The photos with the brown background were taken when my son was 12.5 lbs and 22.5 in. Tiny. This truly fits a newborn, especially a tiny one. 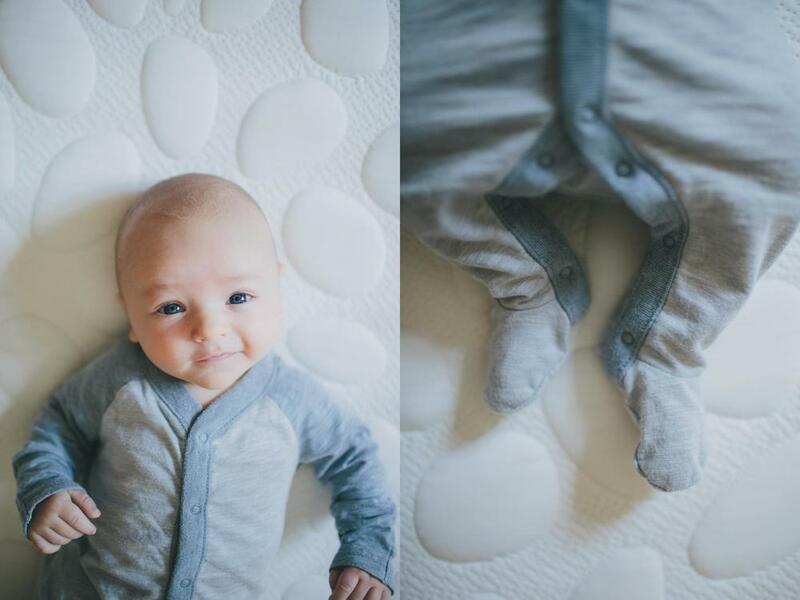 The crotch width is suited for a newborn. Very sizeable. Look at all those snaps! You can adjust the waist and the leg holes. Cute prints! I got so many compliments even though they were kind of girly and I have a boy. Organic, natural materials on the inside. Shorter rise. But I've noticed this about ALL Ragababe diapers. The waist stills fits but the rise causes me to need to size up. There is NO WAY these would have lasted my son to 15 lbs as advertised and the absorbency was outgrown wayyy sooner than I expected. I'd say these lasted longer than the Lil Joeys but not by much. Maybe the problem was that my son just grew REALLY fast (he gained 3 lbs and grew 2.5 inches during the first four weeks fast). I lent this diaper to a friend and she had GREAT success with it on her newborn for months, but he was a preemie. I'm not sure I can be a fair judge of the absorbency... but 15 lbs?! No way. 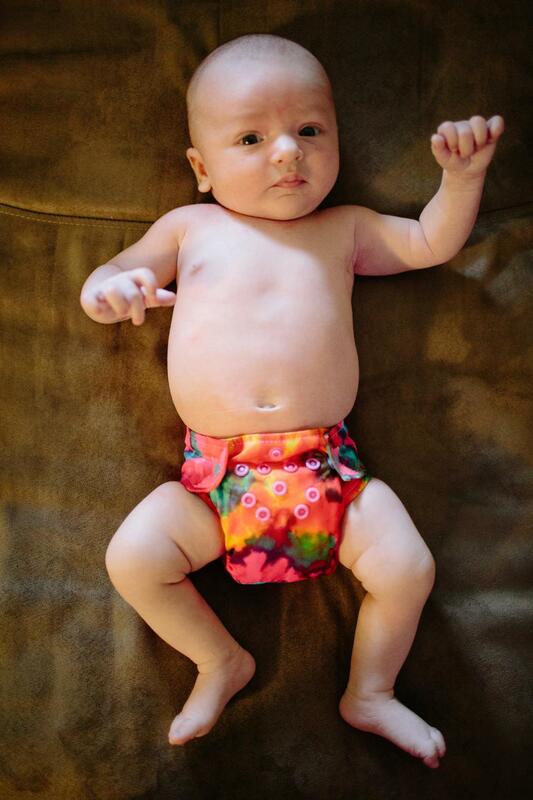 I stopped using the Ragababe newborn diapers by 10 lbs and 3 weeks because they kept leaking wetness. The photo of my son wearing the diaper at 12.5 lbs is just for reference! EXPENSIVE and they're as rare as unicorns. Don't ask how much I paid for the three I own. I might cry and my husband might go into shock. Would I buy these diapers again? I'm keeping the three I've got for future babies but honestly (and heartbreakingly) I was way less impressed with these than I thought I would be, especially since they are so hard to come by and so expensive. So no, I wouldn't buy more! It feels like a sin to admit that. This has ended up being my favorite newborn diaper! It rarely leaks and it's lasted the longest for both size and absorbency. I ended up selling almost every other newborn diaper I tried and bought a full stash of these! We even use them overnight. The photos in the "Down By The Bay" print were taken when my son was about 12.5 lbs and 22.5 in. The photo in the "Snails" print was taken when my son was approximately 10 lbs and 21.5 in. These have and will fit the longest of any newborn diaper I tried. My son is about 12.5ish pounds at 6 weeks old and he's still on the center snap setting with room to spare. I love how trim these are. They fit a little baby's body so well, especially in the crotch. Blueberry releases exclusive new prints all the time to keep things fresh. THESE RARELY LEAK! It's truly a miracle. The only time they leak is if I don't know my son pooped and I don't change him right away and instead carry him around and such... poop usually manages to get on his clothes just the littlest bit around the leg holes in that specific circumstance. And obviously if he goes pee a few times and I wait 5 hours to change him I also risk leaks! And finally car seats are designed to make diapers leak. I'm convinced of it. I can almost always find them on sale at an online diaper shop. Easy to sell after you're done using them! So easy to wash. The insert works itself out on the wash and they dry quickly. You can easily access the PUL to examine it. This is invaluable to help rule out issues with the PUL if you're experiencing leaks. These might not fit a tiny newborn. I can't imagine it would fit a baby less than 7.5 lbs very well, but that's just my guess. The birdseye cotton shows wear quickly. That's just the nature of the fabric. The hook and loop works really well BUT it never stays fixed on the laundry tabs in the wash! My newborn stash currently consists entirely of Blueberry Newborn Simplex. I just love them! I am absolutely keeping all of them for any future babies I might have. 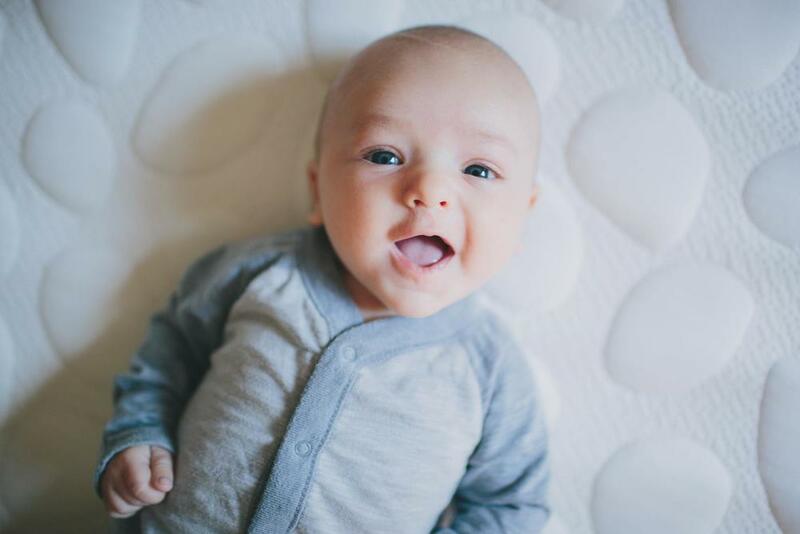 I would still ideally like to have Lil Joeys on hand to use the first two weeks because they fit a newborn so well and then transition to the Blueberry Simplex, but that's just me! Long story short, I hated this diaper. I put it on my son as a last resort and stopped using it when we was just two weeks old because of how much I disliked it. It would serious leak after one pee. The crotch is very wide and rather stiff and it feels awkward to strap onto a baby. The rise is SUPER high and the leg holes REALLY skinny. There's also no umbilical cord stump and it would definitely rub on any baby's stump because of the extremely high rise. The hook and loop strip is wide and stiff and it always folded under where I was trying to adhere the tabs, so it never felt like it fit right. I have no idea what kind of baby would fit well into these diapers because in my opinion they're just a disaster. I've realized that they look like they fit really well in these photos... don't be fooled! I would NOT buy these again and I'm still trying to sell the one I have left! The photo with the white background was taken when my son was about 9.5 lbs and 21 in. The photos with the brown background were taken when my son was 12.5 lbs and 22.5 in. 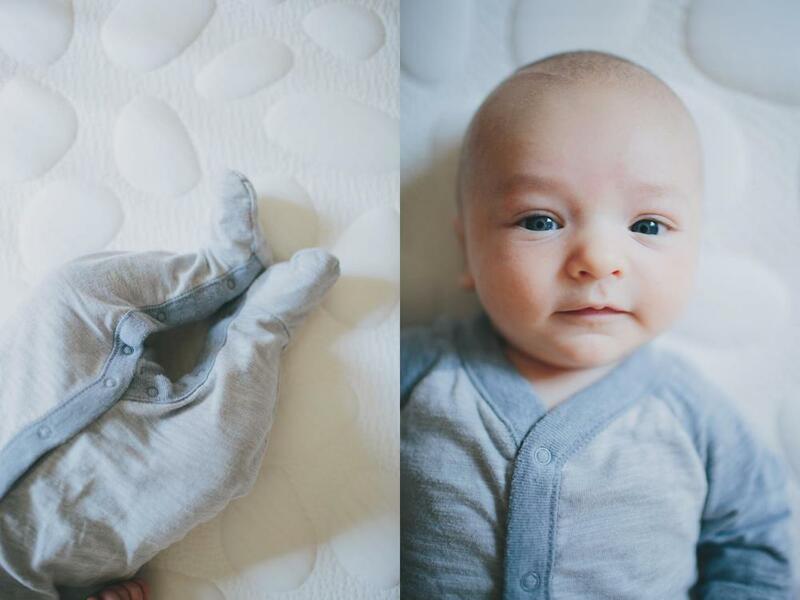 These diapers were similar to the Blueberry Newborn Simplex but not as good in my opinion. Ultimately I'd rather pay a few more dollars for the Blueberry Newborn Simplex! They weren't nearly as absorbent and I prefer the natural fibers of the Simplex. The fit is similar but I think the leg holes on the Basix are a little looser. We had some leaks with this diaper and I think it's because it just isn't super absorbent. The photo of the "Monsters" print was taken when my son was about 9.5 lbs and 21 in. The photo of the blue diaper was taken when my son was approximately 10 lbs and 21.5 in. Old and new style GroVia newborn diapers. These were okay! I only had two so I can't say for sure how well they did or didn't work for us. 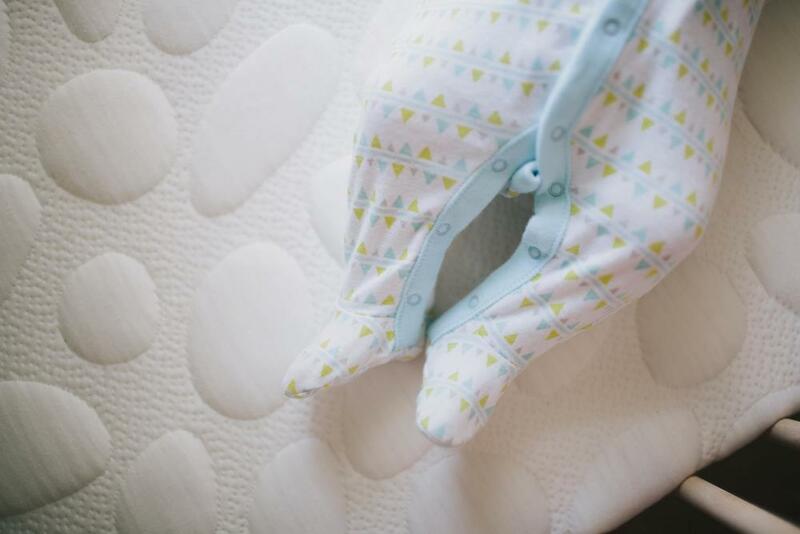 Thirsties Newborn AIO. I only tried these on for size. I loved the fit but didn't keep them because I wanted to stay away from synthetic fabrics. 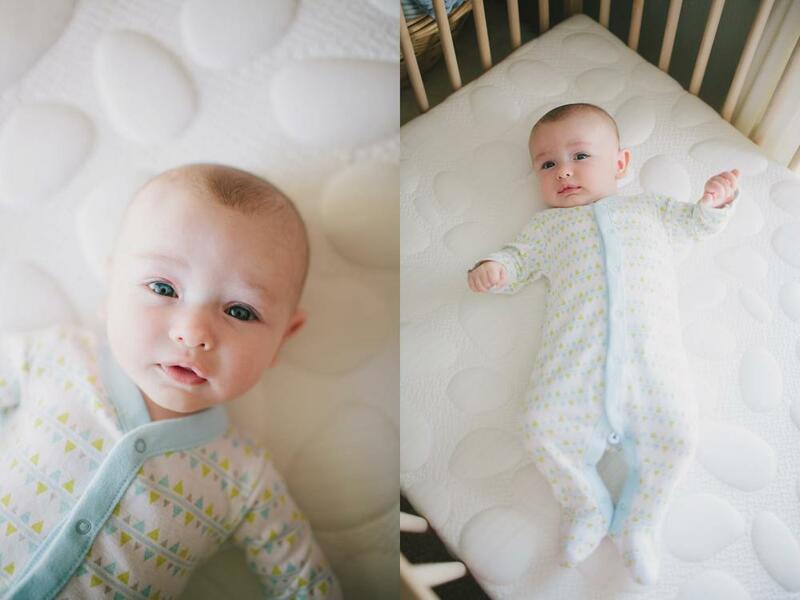 Imagine Newborn Stay-Dry AIO. The fit wasn't bad. The crotch was very wide. I only tried these on my son for size and didn't keep them because I wanted to stay away from synthetic fabrics. Kissaluvs Newborn AIO. I hated the fit of these. The snaps were super impractically spaced and the leg holes were huge! I only tried these on my son for size and didn't keep them because I wanted to stay away from synthetic fabrics.